Auston's garage behind his home was a great candidate for solar. His farm style home uses a lot of energy throughout the year and he wanted to go solar to start saving some money on his electric bill. Auston had a 13.920 kWh system installed on his garage. This system is made up of 48 Hanwha solar panels. Over the next 25 years, he should see about $53,000 in electric savings! 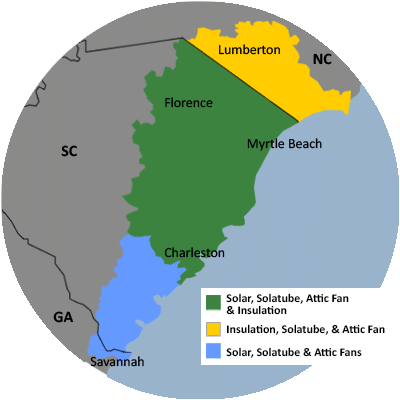 For a FREE no-obligation estimate in Loris, SC, please fill out the form to the right and Carolina Energy Conservation will contact you shortly. I plan on starting my new house build in about 2 months and doing research about what types of solar tube lighting I can get for different parts of the house while its in the construction phase. Looking for an estimate on attic insulation. Radiant barrier for underside of roof. Need roof decking spray insulation in attic of our 1350 sq ft house. From the beginning to the end, I was impressed with Carolina Energy. Their communication skills all thru the job were exceptional. Their staff even took care of submitting the necessary documents for our community's HOA for approval--what a plus! Thanks so much for not only a job well done but also so easy to work with! Before I hire you again I would spend more time making sure your estimate is accurate. I don't think I spent enough time reviewing the estimate to be sure it was accurate. We specialize in a variety of services aimed to lessen your home's carbon footprint and save energy and money each month! We offer it all, from air sealing to ductwork to insulation and HVAC services in Loris, SC. For a FREE, no-obligation services estimate in Loris, SC, you'll also receive a free copy of "Saving Energy and Money at Home," a great book to use as you begin to create a more comfortable, healthy, and energy efficient home!